He received his medal at the opening ceremony of the Annual Meeting of the Australian Mathematical Society held at the University of Ballarat in Victoria. 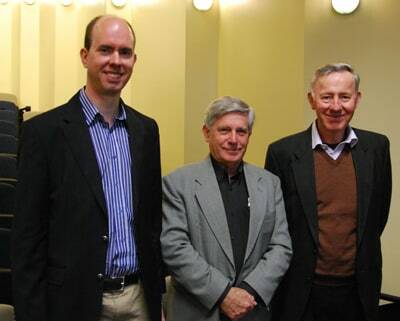 Associate Professor Anthony Henderson (left) won the 2012 Australian Mathematical Society Medal. Pictured here at the medal presentation with winners of the George Szekeres Medal for lifetime achievement: Neil Trudinger from ANU (centre) and Ross Street from Macquarie University (right). The Australian Mathematical Society Medal is awarded annually to a mathematician under the age of 40 years for their distinguished research in the mathematical sciences, who has carried out most of their work in Australia and is a member of the Australian Mathematical Society. "I'm very pleased to have won the Australian Mathematical Society Medal. Winning this medal has been one of my main career aspirations, as it is for lots of young Australian mathematicians," said Associate Professor Henderson. "It puts me in scary company, because many of the previous recipients are now at the forefront of Australian mathematics and its international reputation, including the biggest name of all - Fields Medalist, Terence Tao," said Associate Professor Henderson. "I'm particularly happy to join two of my University of Sydney colleagues in this club, Professor Alex Molev who won in 2001 and Professor Andrew Mathas who won in 2006." Associate Professor Henderson works on geometric and combinatorial aspects of representation theory. Associate Professor Anthony Henderson won the 2012 Australian Mathematical Society Medal for his distinguished research on geometric and combinatorial aspects of representation theory. "When we talk about a 'group' in mathematics, we mean a collection of operations which preserve something. For example, in chemistry, if you have a molecule which has some symmetry, then there are rotations and reflections and so on which leave the molecule unchanged, and those form a group. These groups come with a kind of multiplication, because you can do one operation and then a second one, and that whole process is a third operation in the group," said Associate Professor Henderson. "My research is in representation theory, which studies how to represent one of these abstract groups of operations by a concrete collection of matrices of numbers, so that the multiplication is just the standard multiplication of matrices. These representations are very useful for calculations relating to the original molecule or other original function; they're also needed to describe the states of various particles in quantum physics. But it can be hard to find representations, and there are some basic classes of groups where we still don't know them all after more than a hundred years of searching," explained Associate Professor Henderson. "My main contribution has been describing new representations of old groups, using homology to get a representation of the original group. This idea goes back decades, but what I've done is to find various new ways to make it work," said Associate Professor Henderson. 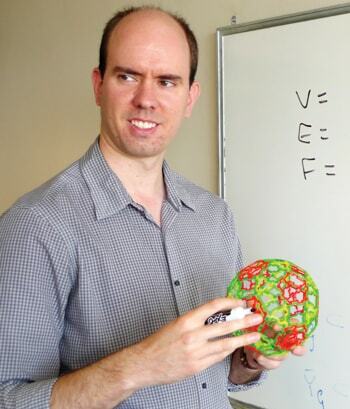 Associate Professor Henderson has been a member of the Australian Mathematical Society for eleven years, since the time he graduated with his PhD from MIT, in the US, and started working at the University of Sydney. He completed his Bachelor of Science with First Class Honours in Pure Mathematics at the University of Sydney, for which he won the University Medal. The Australian Mathematical Society Medal was first presented in 1981. This year there were two recipients: the other was Dr Stephen Keith, who works for the Macquarie Group.